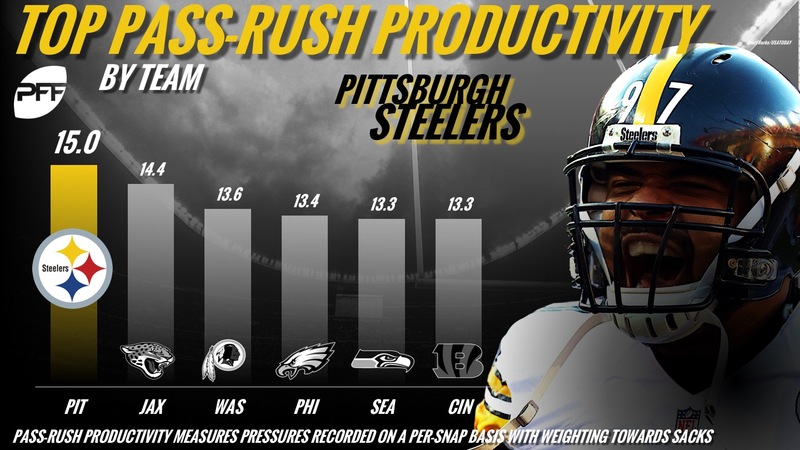 Of all the statistics and metrics that Pro Football Focus collects, pass-rush productivity is one of the most important because of the limitations in box score statistics. Sacks are seen as the end all, be all of pass-rushing, but they are actually an extremely volatile statistic that often owe more to luck and happenstance than a quantifiable, measurable pass-rushing trait. Looking at pass-rush productivity, it is significantly more predictive when it comes to future sacks than looking at sacks, as is total pressures, which of course folds into our pass-rush productivity metric. This offseason, we have worked to improve the weightings attached to our pass-rush productivity metric to lend appropriate weight to the value of sacks as compared to hits and hurries as determined by our analytics experts. As such these PRP numbers may differ from others you’ve seen elsewhere on PFF. So let’s dive into what 2017 showed us from both a team and an individual player perspective.